When you have insulated vinyl siding installed on the outside of your home, it will make your house look great and instantly improve your curb appeal. But insulated vinyl siding will also do more than just give your property’s appearance a boost. Here are some of the other advantages that come along with installing it. It will keep the temperature in your home more comfortable. Are there certain parts of your home that feel too cold in the winter and too warm in the summer? It could be because you don’t have enough insulation in place. With insulated vinyl siding, you’ll be able to keep more air from inside your home in and more air from outside of it out. This will make your home more comfortable always and allow you to heat and cool it more effectively. It will lower your energy costs. In addition to keeping your home comfortable, insulated vinyl siding can also cut your energy costs down dramatically. When you have too much air passing through the walls of your home, it can force your HVAC system to work extra hard to keep your home at your desired temperature. This can obviously drive your energy bills up and force you to pay too much every month. By installing insulated vinyl siding, you can bring your costs back down and keep them low. It will prevent noise from getting into your home. Have you just about had it with your noisy neighbors or the street noise that is constantly coming into your home? Insulated vinyl siding can help with this, too. You can cut down on the amount of outside noise that makes it into your home and enjoy the peace and quiet it will provide. You’ll notice a big difference in the noise levels inside your home when you have your new siding in place. 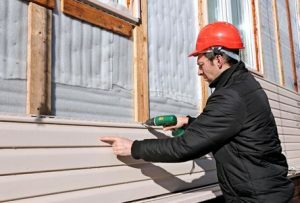 Undoubtedly, there are many reasons to install insulated vinyl siding on your home. If you’re interested in doing it, Roofing by Bruce can show you your new siding options and install the one you like best. Call us at 570-424-8891 today to schedule a siding consultation.